Within the regular class time, we had time to work on our semester project. It is very interesting to listen to project updates from different teams/individuals. Particularly, one classmate gave us one solution for our current difficulty that is making the bottom of the cup holder adjustable,and professor provided us valuable suggestions on our project. Last week, Jiaqian and I discussed the different designs for cans holder. Comparing cons and pros, our team decided to have a fixed bottom with an adjustable handle not only because the design will be easier for us to implement, but also considering the material as well as time costs. Currently, we have measured the normal size range of cans and start to draw the parts in Fusion 360 in order to 3D-printed it. 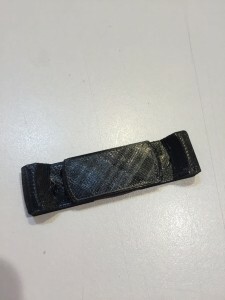 Our design has been broken into four 3D printing parts and one external part. I printed one of the parts of the bottom, which it only took 20 minutes. The design is a very time-consuming work. 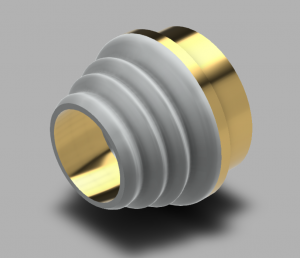 Cutting, extruding and modifying are all completed based on Fusion 360 tools. Due to the unfamiliarity of Fusion 360, I cannot quickly reach the points that I want to achieve. Fixing a small line of the design sometimes takes me more than half an hour. I hope we could complete the project on time. On Monday class, the major task for me is making the handle design adjustable so that it can fit any sizes of cans. We would like to add a temperature meter (external part) on our design for future users so that people will be able to know the drinking temperature and enjoy the best tastes. 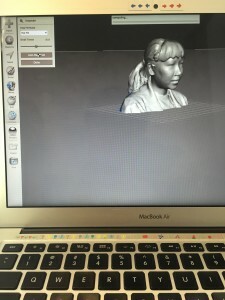 The topic of this week is 3D scanning in the use of Meshmixer developed by Autodesk (http://www.meshmixer.com). 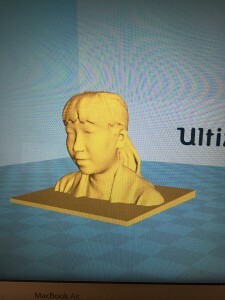 I saw some of my classmates use the scanner on the 3D printing expo last week, so I am very exciting to create my own model. There were three major steps from scanning to printing. 1. scanning 2. modifying 3. printing. The professor provided us two different types of scanners for capturing human faces and part of the bodies. One of the scanners is very user-friendly, attached to an Ipad. Another one seemed more completed and time-consuming. 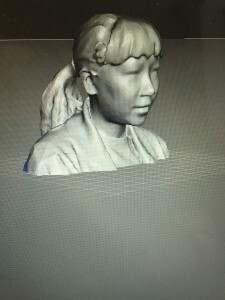 During the class, the first step we did was collaborating with a classmate to finish the head scanning. Jiaqian and I were assigned to the Ipad scanner. Basically, one people just held the head and tried to keep it still. The partner rotated steadily on an axis in order to capture all details until the processing percentage reached to 100%. Since we were the second team to use the Ipad scanner, we got lots of suggestions from the first team. It helped us to save time and avoid failures. Then, after completing the scanning, we had to email the files to ourselves for further modification. “Meshmixer is state-of-the-art software for working with triangle meshes.” It is free software that is able to work on windows and mac. 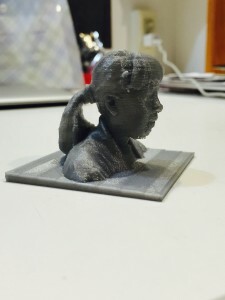 Meshmixer provides a large variety of tools which allow the user to do different types of modification, such as 3D Sculpting and Surface Stamping, Automatic Print Bed Orientation Optimization, Layout & Packing, etc. Some tools on the menu bar were confused me in the first place, but with the help from classmates, I quickly overcame the issues. 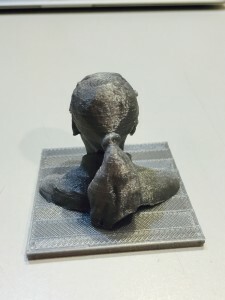 The most difficult part for me is attaching the bust to a base because it involved multiple adjustments to make it perfect and avoid the hollows between two parts. 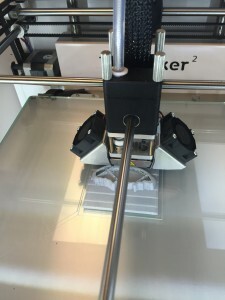 The final step was exactly like general 3D printing, which it was transferring the file to the Ultimaker 2. The overall printing took approximately 1 hour and 15 minutes. The lesson about the scanning was a very interesting experience. 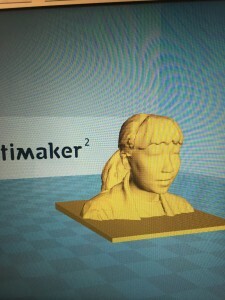 We not only had the chance to learn benefits and current implementations of 3D scanning but also got a hand on experience to actually design and print out my bust. I believe 3D scanning will be extremely useful for the future model design because of the convenience and very few restrictions. 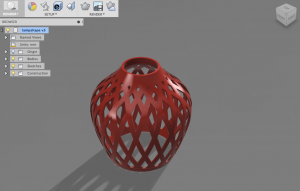 Any completed shapes of the objects can be easily scanned and modified through certain software. The creations are able to make huge changes on the current models. It also saved designer time on sketching the outlines. 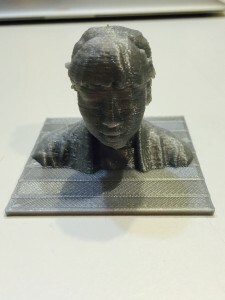 The only limitation 3D scanning should be improved is the accuracy. There are some differences between the design model and the real case. It was our last time to have an exciting class session in the FabLab this week. 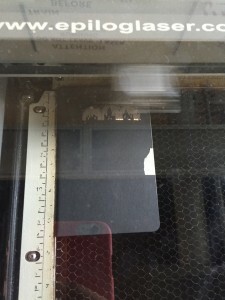 We were assigned to laser & cutting station this time. The FabLab allowed me to know lots of creative and interesting topics that I have not tried before. Through the creating and making process, I not only learned the steps to complete the desired work but also understood the functions of the machines. The first step to in laser cutting is to select appropriate images, such as black & white pictures or logos with fewer color layers. The reason why we choose those typical pictures is that we want to have clear shapes and outliers for laser engraver. 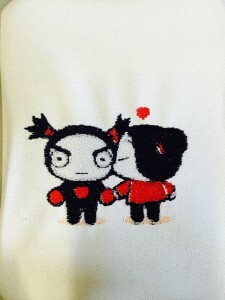 The platform used to modify the images is called Inkscape, which it is very similar to the software we manipulated in Textile and Fabric station last time. It is convenient to execute different tools to change shapes, add texts and modify colors. Everything is straightforward and easy for a beginner unless you have unique/completed requirement on the projects. Then, after preparing and designing the pictures, we need to decide the material for the laser. 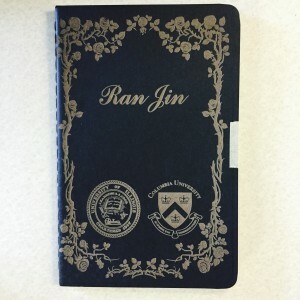 I choose notebook laser because I would like to have a personalized and special notebook for collection purpose. I also design another notebook with cartoon characters for my friend. With the help of people from FabLab, I quickly laser the pictures on two notebooks which only take less than two minutes. I am so surprised about the speed of the laser process. 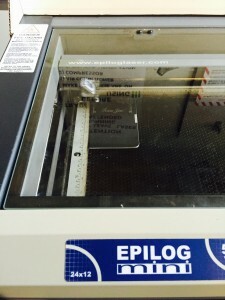 The most difficult thing in this working station is to know how to run the Epilog Mini (Legacy) because there are some strict safety rules we need to pay attention to. The whole workshop only took one and half hours, so we are able to exchange the work and help each other on designing cool images. 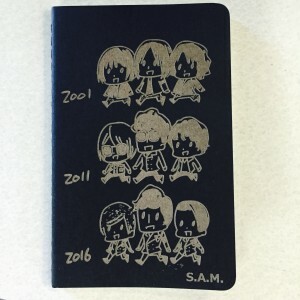 I really enjoy the process to laser a notebook by myself. Thanks for the FabLab, I have this unique and valuable time to learn how to use technology to create amazing staffs. 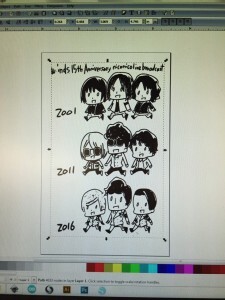 Currently, we are still in the planning stage trying to figure out what is the doable design. One design would be like Figure One where the bottom part is basically of fixed size and the arm is adjustable through a circular structure. The current design difficulty is that we have no idea how the joint part of those two arms are connected and how can we make sure that the two arms can be smoothly slides out, neither do we know the correct radian of the arms (and the radian is likely different at specific positions) so that when they slide out further it allows to hold larger/smaller cups. The second possible design is very similar to the adjustable round table in this YouTube video https://www.youtube.com/watch?v=tOp5j_57LAE . We are basically going to have an adjustable bottom part, and for the bottle, we are going to use an elastic band to wrap around it in order to keep it fixed at the position. The difficulty of this design is clearly the bottom part. In the YouTube video, there are a lot of metal joint parts and we were thinking whether it is possible to just 3D print all the parts that when assembled together it would have the same adjustable function. 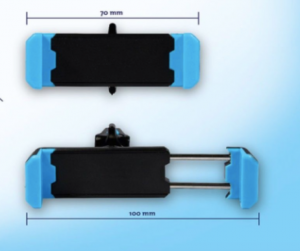 The possible alternative to the bottom part also can be a flexible clip (the idea is similar as car phone holder, Figure Two). 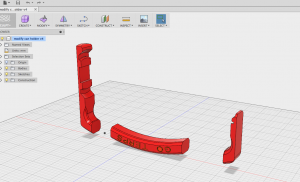 Once we decided which design to go for, we are going to measure normal size range of bottles and start to draw the parts in Fusion360 in order to 3D-printed it. I was so surprised that we actually were allowed to build a real 3D printer/upgrade Ultimaker 2 to become an Ultimaker 2+ in the first class of the spring break. I was excited when I saw the announcement on the Facebook page. It would be a good time to know the technical details behind a 3D printer. 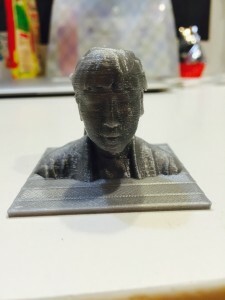 While knowing how to use the 3D printer is the primary goal for 3D printer beginners, understanding how the printers work is interesting and beneficial to us as well because we are able to make improvements during the process of assembling. We started to organize the event around 2 pm in the BIF atrium. The representative from Ultimaker provided us several small packages of kit for building 3D printer and a Ultimaker 2 printer that was ready for upgrading. 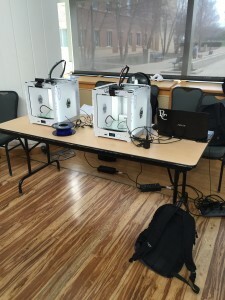 He encouraged the people who were willing to assemble a 3D printer separate into two groups (Frame & Extrusion head to start the task at the time. He also mentioned that the process was just like equipping Ikea furniture. As the matter of fact, assembling a 3D printer were much frustrated than building furniture even if people have previous experience on assembling. I chose to work at the Extrusion station with other five classmates. We firstly opened the Ultimaker assembly manual to check every piece of materials required to build the extrusion head housing. The manual was outdated so that everyone felt confused to find the correct kit since the numbers on the packages did not match with the numbers on the instruction. The process was slow and inefficient at the beginning. Discovering the issue, we found the last version on the website and decided to move forward as well as follow the steps on the new guide. 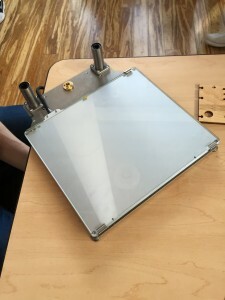 The collaboration accelerated the speed of assembling the extrusion head housing. Each two people worked on a small part of the current stage, then we combined the pieces together. The most difficult thing among the whole process was getting all of the screws in because different piece required certain lengths/types of screws. We had to measure those screws carefully before putting staffs together. The time to complete extrusion head housing should be 60-90 minutes on the manual; however, the actual time we used on this stage was almost 3 hours with the help of professionals. This would be the most challenging task in this class so far. In addition, I worked with two people on completing Z-stage (print platform) in the second half of the class. Again, there was lots of screw work, but the tools provided by the Utimaker were not helpful. In sum, I enjoyed the whole process of assembling the 3D printer. It seemed like a mission impossible for us due of lack of experience on assembling, but we never lacked teamwork between each stage. This practical experience was kind of memorable and valuable for myself since I spent most of the time on learning management, marketing, business strategy, etc. Participating the assembling work allowed me to understand the completed functions of the 3D printer and how those small pieces actually worked together on the machine. I highly recommend people to participate this interesting activity! 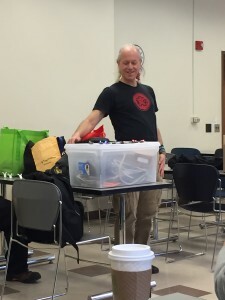 In the past week, we had a chance to learn with Mitch Altman, an awesome alumnus who is a hacker, inventor and international expert on the hackerspace movement as well as introductory electronics workshops. 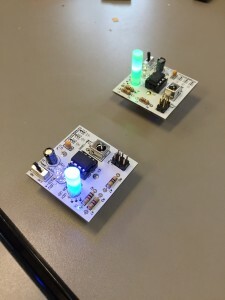 “In 2004 Altman released a one-button universal remote control called TV-B-Gone, to be used for turning off TVs in public places.” The main purpose of this workshop was allowing us to build a Trippy RGB waves through basic soldering skill. I was very exciting to see Trippy RGB waves before we actually started the tutorial section. Although I do not have any previous knowledge of electronic engineering, I did soldering a simple fan when I was in the elementary school with the help of my father. However, I barely remember the process of using tools and melting iron in order to allow each component to attach to the main panel. 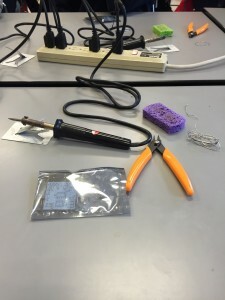 Thanks to this very detailed lesson with Mitch, I recalled my memories of soldering. The tools we used in the class are very similar to what I owned in 15 years ago. 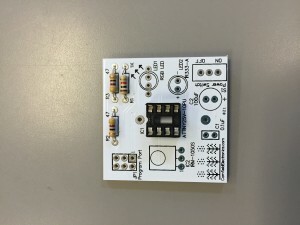 I felt soldering is a very fundamental skill for engineering to connect small pieces electronics together. Although I do not have any previous knowledge of electronic engineering, I did soldering a simple fan when I was in the elementary school with the help of my father. However, I barely remember the process of using tools and melting iron in order to allow each component to attach to the main panel. 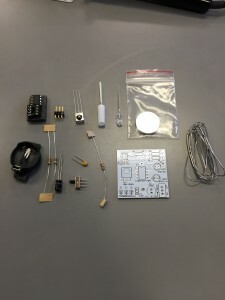 Thanks to this very detailed lesson with Mitch, I recalled my memories of soldering. The tools we used in the class are very similar to what I owned in 15 years ago. The only difference is I did not have a sponge to clean up the head of the solder so that extra iron and heat will not impact the quality of the following work. 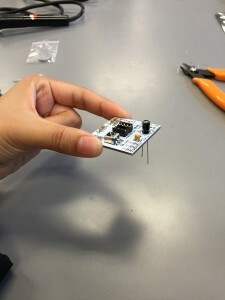 I felt soldering is a very fundamental skill for engineering to not only connect small pieces electronics together but impact the innovations and different types of research. Mitch had a lot of passions and patience to teach everyone in the classroom to complete our first Trippy RGB waves step by step. He also explained the functions of each component in the power point. I thought it was meaningful, interesting and useful for us to understand the stories behind the soldering. As a business student, I felt this workshop is an amazing opportunity for me to learn the one of the most important engineering skill. I’ve already gained lots of interesting and useful technical skills from this class. I expect to utilize those hardware and software knowledge on my future project. Mission: We switched from electronics station with Arduinos to digital embroidery station. I cannot wait to use the sewing machine to a small piece of artwork. 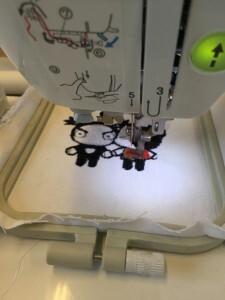 Basically, the sew machine works like a 3D printing machine that helps users transfer electronic version of art designs to physical textiles on a sheet of fabric. There are more steps that are required than I thought before making the machine work. How it Works: The first step is having a completed picture/design ready on the computer. Then, we need to use a software called SewArt to modify the original picture file in order to get rid of unnecessary colors. The SewArt works like Photoshop or drawing software to allow user fix the shapes, adjust the size of pictures, eliminate/change the printing colors in implementing “Merge” function or trim any details depending on the user requirements. The software is very flexible and customized tool to tailor design ideas. When I modify my selected picture, I found that there are lots of hidden colors that I might not print existing on my work file. It is indispensable to clear the design before moving forward to the next step. After the editing process was finished, I was assigned to a sewing machine finally. 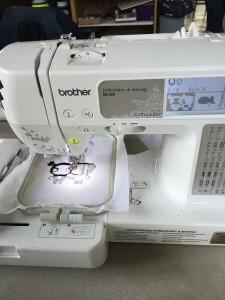 Suzanne Linder helped me connect my working document on a USB drive to once of the sewing machines.The machine automatically generates working steps on the screen, and it reminds users to change the colors when one color are completed the printing process. The most difficult thing for me is threading. I was frustrated at the beginning to follow the steps on the machine to thread the needle. Fortunately, I got help from lab instructors and classmates. Ultimately, the needle starts to “print” shapes with various colors on the fabric. Thoughts: exciting and special experience! I love the class design of BADM 395, which it allows us to experience and explore on different making tools. Simple sewing machine could have huge impacts on fashion design because fashion designers are able to “print” complex patterns. Digital embroidery might not mean/help too much for my project design, but it does expand my eyes on digital making. 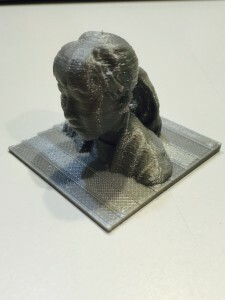 Furthermore, as I mentioned in my previous reflection blog, the downside of 3D printer is restarting the whole printing process if we fail in the progress, which it will be time-consuming for designer and increase material waste. 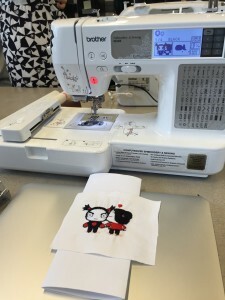 Comparing to 3D printer at the MakerLab, sewing machine allows users to stop the work anytime and take off fabric from the platform once printing issues happen. I think the design of sewing machine should provide some ideas for 3D printer designers to improve the weaknesses and the quality of user experience. What is the second oldest building on campus? The answer is Champaign-Urbana Community Fab Lab! 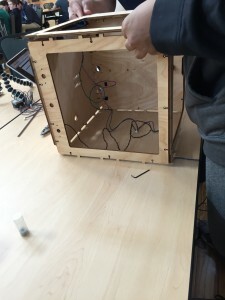 It was a special, interesting and exciting learning process to have the first-hand experience in utilizing various tools, materials and software to complete from complex prototyping to a simple art design. I wish I could know this amazing lab earlier because I would explore project ideas, prototype different models or collaborate with talented specialists on projects. 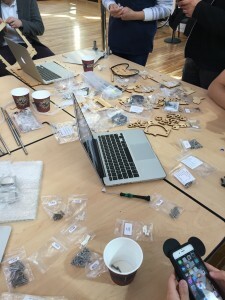 Fab Lab provides very comprehensive open resources as well as cool DIY equipment for designers, engineers and anyone who is interested in making something. Because of the variety and flexibility, the lab encourages the public to engage the entire design process and inspires interest and innovation in many fields. 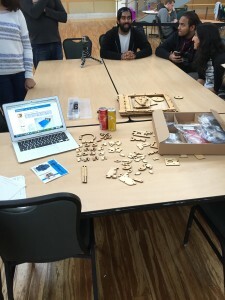 However, Fab Lab for me is not only an advanced workshop space for rapid prototyping and computer-based design, but also is a tutorial resource to help me solve issues and refine project ideas. We were firstly separated into two groups to take a quick tour of the building during the workshop. I followed Jeff, operations lead and adjunct faculty in Informatics, to visit different working stations, including electronic cutters, textiles and fabrics, electronics resources, and graphic design and art. Then, there were seven people, including myself, assigned to electronics resources with instructor Colton. Several microprocessors and mircocontrollers are available in the small working area, allowing us to manipulate. 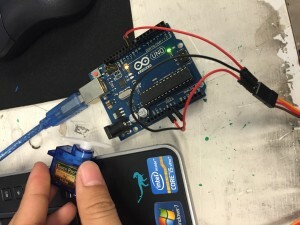 Through the session, we used Arduino to control LED light bulb frequency, switch the frequency and degree of a motor, and a touch sensor that is able to convert physical pressure to measured numbers on a small piece of electronics kit. Someone even took further steps to write codes that were able to control those add-in materials to work together. 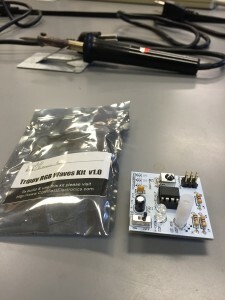 Writing codes and assembling pieces of electronic material are not my strengths, but I would like to engage in the learning process and try new things. Thanks for the help from classmates and Colten, I did make those small board work. Furthermore, this is a good time to confirm some conceptual ideas with experts in the lab. 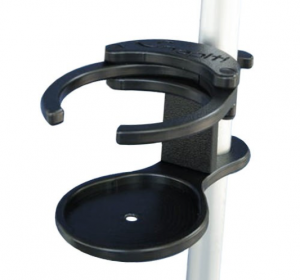 I got some feedbacks about my “multi-functional cup holder” project, which they are helpful for me to modify designs. 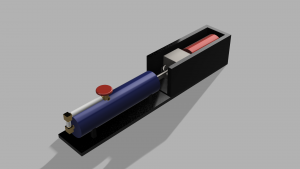 Colten came up with a concern about the efficiency of energy output in my design, as well as cooling down the product when converting heat to electricity. 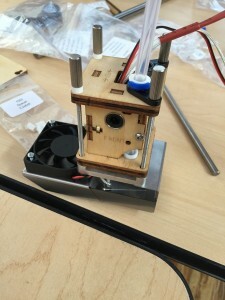 In the future, I really would like to share Fab Lab to my friend and related classes. It is a great workshop for any independent academic purpose learnings or research. Fab Lab is operating as a small company who is looking for innovations and inspiring people to make community become better. 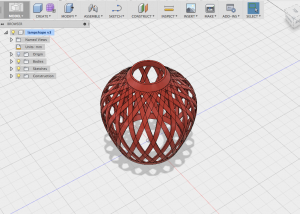 Within the last two weeks, we were basically getting familiar with Autodesk Fusion 360 platform to sketch different creative ideas and transfer products into 3D models. It was very exciting to get first hand experiene on deign interface with Autodesk expert Lucas Ewing. The first half of class was spent on navigating the general layout of Fusion 360. In the second half of class, we moved to design stage which was learning how to create a pen tip, inspired by a Bic ballpoint pen, guided by our expert. 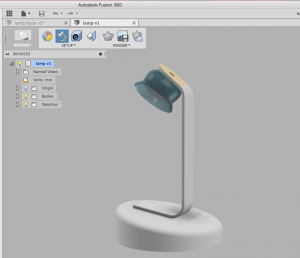 For our next class, Professor Vishal brought in campus Autodesk experts Gina Taylor and Nicole Chimienti to help the class to create a lamp in the use of Fusion 360. The following are several selected design examples posted on course website. We all enjoy playing different funcitons on Fusion 360 to create incrediable samples and display innovative ideas. Lots of classmates share the interesting using experience on their blogs. For example, ” I always thought that 3D modelling was a black art of sorts, but in reality it’s extremely intuitive. It’s a lot like programming, something I’m very familiar with, but for physical objects. Programming is all about breaking a complicated process down to its individual steps, and modelling is about breaking down an object into its individual components. Now that I’ve seen how it works, I can’t wait to try more.” said by Prithvi. “I have a very strong background in a few Autodesk product like AutoCAD, Revit, and Rhinoceros therefore a lot of what we learned in class felt like a review. Other things we went over though really amazed me. 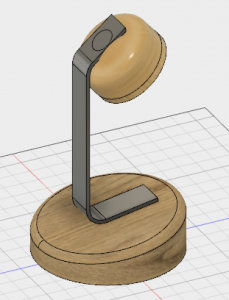 The simplicity of Fusion 360 and user friendly platform really won me over. Fusion is much simpler than many of the other software’s I use but still enhance enough to where we can design and create crazy awesome products.” shared by Harina Jayswal. In sum, the workshops are good practicing time for us to be familiar with the software. While we have limited time to get more advanced trainings on Fusion, Youtube tutorials and other resources from professor or classmates are good tools to learn different functions and models. Some people are going to use this user-friendly software on their semester project ideas since Fusion 360 is a very flexible, easy-learning and comprehensive tool to help designers/engineers to transfer initial thoughts into practice. Furthermore, a few classmates think learning process is interesting and useful for their career development because they just knew a new skill from this class to enrich the technical background. Within the last two weeks, we have learnt Autodesk Fusion 360 platform to sketch different creative ideas and transfer products into 3D models. It was very exciting to get familiar with the deign platform in the first tutorial class. The introduction class was a good opportunity to understand the functions as well as implementations of the software, such as the use of MODEL, MODIFY and SKETCH. The options are flexible that allows us quickly build shapes, tailor existing design or even assemble discrete parts together. 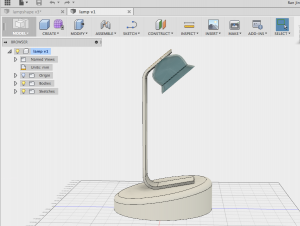 After learning the function menu, I tried to follow a tutorial video designing a lampshade for an off-the-shelf lamp cord. The instruction is straightforward and helpful to practice what we saw in the class. I believe that the self-practice is indispensable to help me better prepare the workshop on the second Fusion 360 workshop. In the second workshop, we moved to a more complex model—lamp, which involved several types of functions, including extrude, offset faces and FORM. During the workshops, I saw the flexibility and customizability of the platform that allow users to complete the same project in multiple ways. It is convenient to track design steps and check errors by looking at the project in various angles. I am very enthusiastic to learn this new software and gain interesting experience on industrial design. 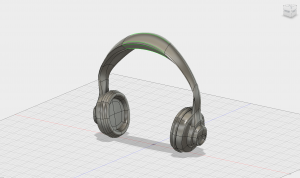 In addition, Fusion 360 really opens my eyes on product designing because it is an efficient technology to transfer ideas into reality in short period of time with no limitations. Business and manufacturing industries should take plenty of advantages from Fusion 360 in developing new products, testing inherent functions from current designs, or printing intricate models in order to reduce operation and research and development (R&D) costs, more importantly curtail the time of introducing new projects to the marketplace. 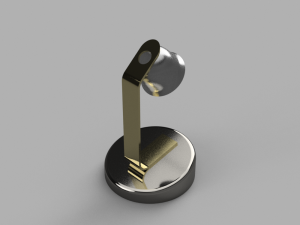 I am very glad to have Fusion 360 design experience in BADM 395 because there is one more technique skills that I am able to add on my resume. In the next five years, I aspire to work as technology management consultant to assist business convert intangible assets into profits. Equipping with the skill of 3D designing, I believe this unique and intriguing experience will help me better understand of their research and product development progress.